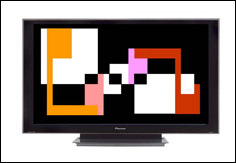 VisualMusic Art can now be purchased separately in its original form as a Multimedia work of art for viewing on a CD or DVD with each title made up of hundreds or original abstract paintings created by the artist as a visual accompaniment, played in sync with the music, interpreting measure by measure the music's structure and form. In addition, VisualMusic Still Art which are outtakes from the Multimediacompositions are available in several formats as: limited edition gicleeson canvas, limited edition prints, posters and commisioned works. Note first generation works under "Gallery Art" from the 2006 Lenox collection are one-of-a-kind mixed media paintings on Canvas. Display your paintings along with a flat screen that plays a companionDVD featuring your still art as part of a complete multimedia music-animated composition.